-Iron art materials, strong and durable, can be placed fruits, snacks, CARDS and other decorative items. -Open design helps fruits and vegetables to ripen evenly. -Ideal for adding convenience to your kitchen or any room,display your fruit and veggies in your kitchen,or fill it with anything else worth being showcased for a stylish touch. 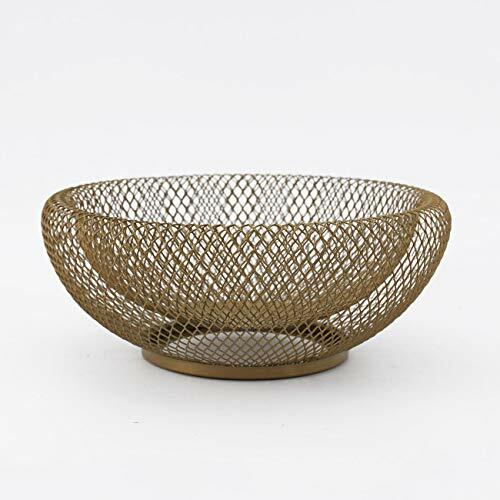 NATURAL DESIGN: The bowl's beautiful gold wire design enhances the fruit display. LARGE CAPACITY: Measuring 10" diameter x 4.1", the round fruit dish will hold a wide variety of fruit. FRESH & RIPE: Open wire basket design allows your fruit to ripen thoroughly, ready to be enjoyed. STRONG & STURDY: The metal construction includes feet on the base, keeping fruit clean and dry. ELEGANT: Bringing you elegant, affordable home products for over 40 years. If you have any questions about this product by VALUEDEBUT, contact us by completing and submitting the form below. If you are looking for a specif part number, please include it with your message.